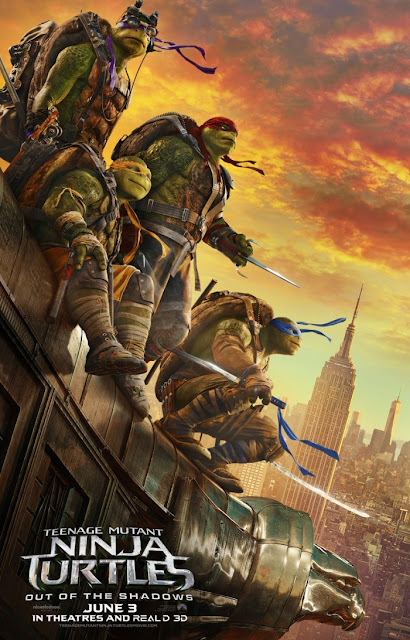 You know, we have recently gotten new trailers for Suicide Squad, Fantastic Beasts and Where To Find Them and Central Intelligence, but the trailer I actually go into is Teenage Mutant Ninja Turtles: Out of the Shadows. You know why? It looks fun. I am not about to say it will be one of the best movies of the summer or even better than the films I mentioned (maybe Central Intelligence), but given all the doom and gloom we have been seeing lately, there is a lot here suggesting Out of the Shadows could be a fun breakout sequel that delivers more on a new theatrical version of a series that has continued being a presence in the lives of many kids (and kids at heart) for a few decades now. No, I wouldn't call 2014's Teenage Mutant Ninja Turtles a good movie, but it also wasn't the trainwreck others considered it to be either. Now it's not as if this movie has a high bar to clear as a result, but for fans of the franchise, just look at all the added elements that are, at the very least, giving fans things they like about this world. In addition to our radical turtles, we now finally have Beebop and Rocksteady, Stephen Amell as Casey Jones, Tyler Perry (of all people) as Baxter Stockman and Krang (to be voiced by Fred Armisen). That is a lot of bang for your buck and again, while my excitement is tempered by knowing how the first film played out, director Dave Green (Earth to Echo) looks to have assembled a movie with an emphasis on fun. It has grand, colorful action sequences, lots of humor and a looseness that seems to suggest anyone can come along and watch this movie. Obviously, not everyone is going to feel the same way and I am not saying that being light over dark is better (it really makes no difference, as long as a good movie comes out of it), but wouldn't it be great to want to look forward to a movie like this? If I am going to get a big budget Turtles movie that will likely never approach the character-driven take on the comic series that was seen in the original 1990 film, wouldn't it still be great to get a fun adventure film. Surely we have had enough time to get past how ugly the turtles are at this point, so we can focus on other things. Will the plot be amazing? Are there going to be interesting things going on with these characters? Krang??? I don't know the answers to these questions, but I do know what I am seeing and so far and for the kind of movie this is, it looks like goofy fun.